The Adjuster editing tool is used for quickly moving and/or adjusting performers in shapes and transitions without having to first select the performers. On the Count Track, move the Red Anchor to the count of drill where the change of path adjustment will stop. Move the Yellow Anchor to the beginning of the transition where the path adjustment will start (usually the previous set). If you want to limit the adjustment function to a number of performers, select them first using one of the Selection tools. This is optional, however, as you can open the Adjuster tool without selecting anyone. 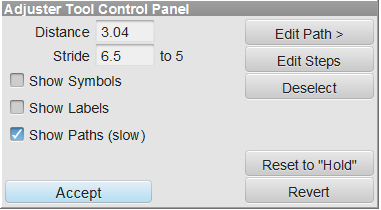 Click on the Adjuster editing tool or select Adjust To from the Edit menu and the Adjuster Tool Control Panel will appear. If any performers were selected when starting the Adjuster tool, red editing handles will appear over each performer. If you want to move them all, click and drag on one of the editing handles and they all will move. If you want to move only one individual, click Deselect if any performers are selected to remove all of the editing handles, then click and drag any single performer. If you want to move a few performers at the same time, hold [SHIFT] and click on each performer until a red editing handle appears over every performer you wish to move, then drag one of them. The other performers will move similarly. Edit Paths allows you to change the pathing of the selected performer(s). Edit handles can be removed to create smoother transitions by clicking the Fewer Handles option. To edit individual steps of a performer’s existing path, click Edit Steps. Editing handles will appear at each step of the selected performers. If you select more than one performer and edit a step of one performer, the same step for the others will similarly move. Since an editing handle appears at each step, it may be necessary to zoom in to the area of the performer to drag the handles easily. Show Paths shows all of the paths of the selected performers or the performer you are adjusting. Show Symbols shows the symbols of the selected performers while you are adjusting. Revert removes all changes made while adjusting and starts the Adjuster tool over. Stride and Distance boxes show the current stride and distance of the performer whose location you are dragging.